It’s the average person’s dream to have pasta for dinner every night, knowing that their pasta dish is extremely nutrient dense, satisfying and absolutely flavorful. For some reason, that doesn’t seem to be the case for me. I much prefer a large stir-fry of sweet and spicy sauces with tofu, vegetables and salad, or a warming curry of Thai or Indian cuisine. But it wasn’t until I discovered black bean spaghetti and edamame spaghetti when I found myself hooked on legume-based pastas, not just because their nutritional profiles are so much healthier. Legume-based pastas are much more satiating, easier to cook, soft in texture and they do not weigh you down so much like conventional pasta dishes. Let me tell you about Banza pasta straight away: Banza is basically a brand that specializes in healthifying our favorite comfort food, aka pasta, and have created an entire collection of chickpea-based pastas! What I love is that this company mixed the health benefits of chickpeas with all essences of our favorite noodle. It is basically my dream of food science, health, sustainability and deliciousness in a box! The reason why I incorporate this pasta into my weekly meal prep routine is because its cooking time is extremely quick and easy (we’re talking <10 minutes), and each serving provides a generous portion of pasta that is tasty, versatile and perfectly satisfying. You will seriously love this chickpea-based company of different pasta variations that also come in boxes of mac and cheddar. They also recently came out with a spaghetti variety! I was so fortunate to have received a free package of pasta boxes as samples from Banza; while I did not get any of their mac n’ cheese boxes, I did get to try their dry varieties of penne, rotini, shell and elbow pasta! Each case of contains pasta that is completely gluten free, packed with protein, loaded with fiber, high in iron, free of GMOs, cholesterol and trans fat, and made of only heart-healthy chickpeas, tapioca, pea protein and xanthan gum. Every variety of pasta contains the same ingredients and nutritional information as shown below. Like I said before, cooking is absolutely mess-free…if you’re responsible and you don’t leave the stove unsupervised (a mistake that I do not want to elaborate on). Otherwise, boiling a pot with at least eight ounces of water and heating the pasta for 7-8 minutes plus 1-2 minutes of cooking time is the perfect cap for me because 1) I don’t have a lot of time, 2) I’m lazy, 3) I have lots of work to tend to and 4) I don’t have a lot of time. You will also find that while you’re boiling and draining the pasta, the water becomes very white and “milky”. Don’t be scared–this is due to the saponis, a natural plant compound in chickpeas! Beautifully packaged, abundant with nutrients, allergen-friendly, easy to cook, delicious in taste, you for sure can’t go wrong! There is no acquired taste of chickpeas or anthing else, and I always felt satisfied with my pasta dishes sans boredom. Every purchase clocks in at $30 for six boxes of pasta, with each box containing four servings of pasta that would last you for more than a month at $1.25 a serving! 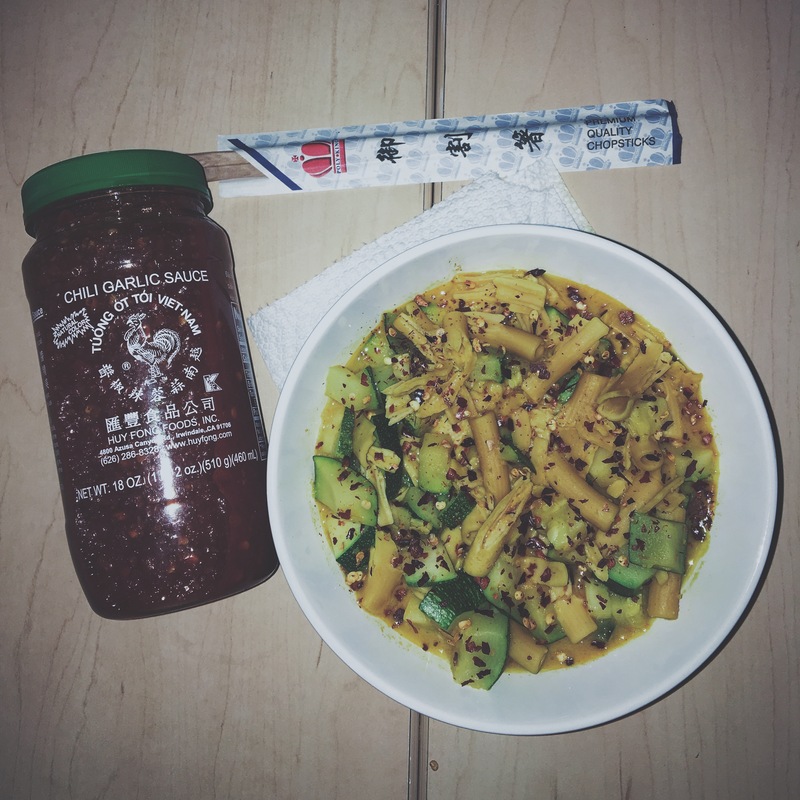 With using Banza as a staple, I found myself really enjoying cooking and getting creative in the kitchen all while exploring new flavors and combinations of food all over again. None from me, but one problem that could apply to others is that Banza currently does not ship internationally, except for Canada. Also, the pasta is not organic and not everybody would find bean pasta to be a completely identical replacement for wheat or any other grain-based pastas. I cannot recommend everybody–whether vegan, vegetarian, gluten free, health-conscious or even any pasta lover–Banza pasta enough! Incorporating this pasta is an amazing way to add in a healthy dose of legumes, fiber, protein, iron and other vitamins and minerals into your diet in a creative way. However, I do prioritize whole foods over anything else, so this should not be the primary source of nutrients that would otherwise be provided by legumes themselves. I always make sure to eat whole beans as often as I can, but regardless, Banza has become one of my favorite brands hands down. Their products and message are absolutely wonderful and I am so fortunate to be spreading the company this way! Okay, so I think I’ve pretty much nailed my love for this pasta line right on the head. Like I said before, I always prefer a big bowl of warming coconut curry over a plate of pasta, hands down. One of them offers that delicious flavor and spice that the other doesn’t, but then I thought, why not combine both and see what I get? Let me tell you, this recipe did not disappoint at all! I remember one of my first thoughts stepping on campus was knowing how much I’d miss eating curry. There’s no place that cooks any real curry dish, minus one Asian eatery that only serves a red curry sauce as a dressing. Definitely not the same experience. Luckily, one of my roommates was so generous in giving me her coconut milk jar to cook with so that I could actually put my butter chicken curry mix to use! And don’t worry–the curry spice mix was completely vegan. To bulk up the recipe, I recommend adding as many vegetables and/or beans as you wish. Not only do they add a ton of volume, they also pack in a high water content and variety of nutrients without weighing you down. For this particular batch, I used a massively jumbo zucchini that I got at the San Luis Obispo farmer’s market for only half a dollar–what a steal, right?! Of course, you can serve this curry with a small side of brown rice (which I wouldn’t do because the pasta is already hearty enough), or serve it atop of a giant plain salad! Optional: chili flakes, broccoli, cauliflower, carrots, sweet potato, peas, bell peppers, etc. Set a medium-large pot on high heat. In the pot, bring 8 cups of water to a boil and add a pinch of salt. Turn the heat to low-medium once the water starts boiling and add all of the pasta into the water. Stir evenly and allow the pasta to cook thoroughly. Depending on the heat, this will take around 7-10 minutes. Set another pot on low-medium heat, or wash your pasta pot thoroughly to reuse for the next step (which is what I did to reduce waste!). Chop the zucchini and set aside, or steam lightly. Stir in the coconut milk and butter chicken curry spices into the pot until everything is completely incorporated. When the curry broth is finished, carefully mix in the pasta and zucchini. Allow the curry pasta to simmer on low heat until it reaches your desired temperature. Serve immediately or store leftovers for up to a week. DAMN, all I can say is that the new blog looks incredible!